I am sending this reminder out now about the GOLD CUP/STUDENT RECITAL on March 30 since it's being held at a different time this year. We will see if this works out having the Gold Cup Recital in March instead of May. The WMC Scholarship Competition is coming up on March 2, 2019. If you have students who want to compete, please submit the appropriate WMC Scholarship Application Form to the chairperson indicated for each competition. Note that there is a separate Chairperson for each of the Piano, Instrumental, and Vocal competitions. The postmark deadline for all applications is February 9, 2019.
is excited to start another amazing season. As we continue the pursuit of our mission to provide dance opportunities to dancers and bring affordable performances to our community, we would like to thank you for your support last year. I just received word that Skip Baird, husband of Emily Baird, passed away this morning. This was sudden and unexpected. 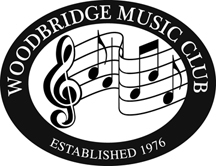 It is once again that time of the year to renew your membership in the Woodbridge Music Club. The suspense date, published in this years WMC Yearbook is July 1st. I and sending this application early hoping that you take immediate action to complete the form and send it to the WMC Post Office Box provided on the form. Last year some of our members were not published in the yearbook because they waited to send in there application. The solution……Fill out the application now and send it! Don’t wait! Also, please fill out the application completely and send it. The information on the form is used for reports that I send to the Virginia Federation of Music Clubs (VFMC), and some to the National Federation of Music Clubs (NFMC). The information I submit in these reports has to do with the type of activities our club and club members are involved in - no personal information is provided on the reports. This is information like how many members participate in church choirs, community band and orchestras, small chamber groups, etc. Also, we use some of the information to publish the yearbook - this information only goes to other members - no further. Some of it I am unaware of unless you tell me - information like how many of you will federate your junior clubs so they can participate in Festival. I have struggled to get this information for the past two years, so please include it. This is published in the WMC Yearbook along with the name of your Junior Club. We also ask for ways that you would like to be involved with the Woodbridge Music Club. We need your help, and if everyone does a little, the Club benefits and, in the end, all of you benefit. Please respond now and send your application and check today! The concert will last about an hour and starts with the American Youth Debut Orchestra (Carter plays principal 2nd in this group and Emily principal viola) followed by the American Youth String Ensemble. This concert is a lot of fun and will feature well known music. The concert will be at the Ernst Cultural Center 8333 Little River Turnpike, Annandale, VA 22003. Music teachers get free tickets, and if you need additional tickets, please let me know and I can get them for you. Contact WMC member Soo Cho for more information. 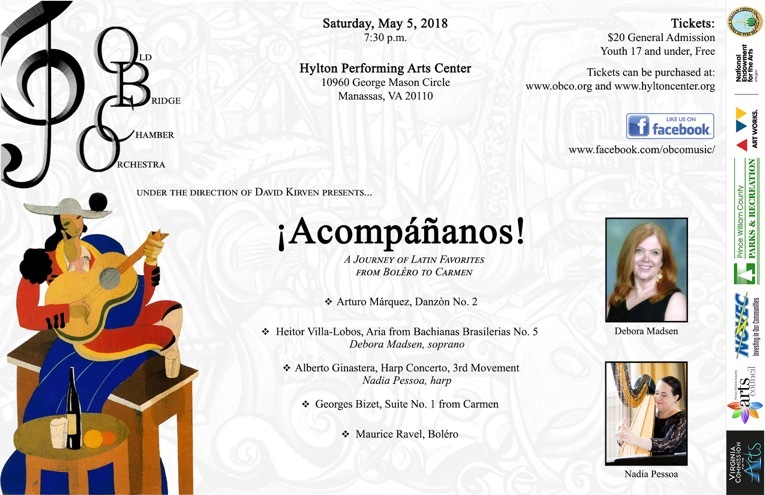 One of our members, Debora Madsen, soprano, will be performing at the Hylton Performing Arts Center on May 5, as part of a program being put on by the Old Bridge Chamber Orchestra. She will be performing an aria from the Spanish opera Goyescas by Enrique Granados, and Patty Parker - another member of the WMC - will be her accompanist. Program and ticket information is on the Flyer below.